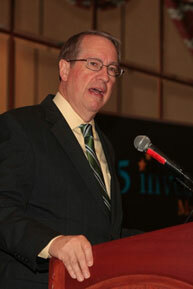 Congressman Bob Goodlatte, Chairman of the House Judiciary Committee, addresses the current state of the EB-5 program at the EB5Investors.com Southern California EB-5 Conference on July 21, 2014. On July 21, 2014, EB5Investors.com and EB5Investors Magazine hosted the Third Annual Southern California EB-5 Conference in Newport Beach, Ca. The event took place at the Balboa Bay Club and Resort directly on the waterfront and featured both Congressman Bob Goodlatte (R-VA-6th District), Chairman of the House Judiciary Committee, and Congressman Darrell Issa (R-CA-49th District), Chairman of the Government Reform Committee, as keynote speakers. The conference functioned as a networking springboard for the more than 350 stakeholders in attendance, including developers, immigration attorneys and other EB-5 professionals, while delivering the most up-to-date EB-5 program information and increasing understanding of pressing topics in immigration reform. EB-5 conference sponsors arrived to the venue early and set up shop in the hallway just outside the conference rooms, where they received tremendous foot traffic for the entirety of the event. The conference itself kicked off just before 9 a.m., with Congressman Goodlatte’s keynote address on the state of the EB-5 program issued over breakfast. This was succeeded by a question and answer session, in which Congressman Goodlatte answered current questions pertaining to immigration reform. 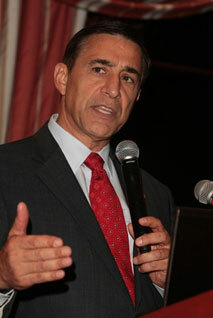 Congressman Darrell Issa, Chairman of the Government Reform Committee, discusses the Skills Visa Act at the EB5Investors.com Southern California EB-5 Conference on July 21, 2014. Following this opening analysis about the EB-5 program’s status on Capitol Hill, attendees migrated into the Balboa Bay Club general conference hallway for a ten minute break preceding the first panels. Throughout the day, these ten minute breaks recurred after each panel, granting attendees time to hand out business cards, build bases of potential clients, and connect with many of the significant figures in the EB-5 industry. The conference as a whole was organized into a dual track format, with beginner and advanced panels occurring simultaneously until 5 p.m., for a total of six beginner and six advanced panels. Attendees easily transitioned between the panel rooms, and both individuals with minimal knowledge of the immigrant investor program, and professionals well-versed in the complexities of EB-5, departed the conference enriched with EB-5 information. The first three beginner panels held before lunch featured, among others, regional center owners, immigration attorneys and entrepreneurs as panelists, and were respectively moderated by Cletus Weber of Peng & Weber PLLC, Elsie Arias of Stone & Grzegorek LLP, and Jonathan Bloch of Jeffer Mangels Butler & Mitchell LLP. Accompanied by slideshows chock-full of illuminating text and graphics, the panelists introduced viewers to the basics of raising EB-5 capital, underwriting criteria for EB-5, and forming successful regional center partnerships. The three advanced panels held before lunch were moderated by Robert Divine of Baker, Donelson, Bearman, Caldwell & Berkowitz PC, Jennifer Hermansky of Greenberg Traurig, LLP, and H. Ronald Klasko of Klasko, Rulon, Stock & Seltzer, LLP, and covered topics which included the impact of visa retrogression on project structuring, commonly overlooked EB-5 securities issues, and EB-5 litigation in terms of tenant occupancy and material change. Following these sessions, guests attended a fine-dining lunch complemented by a discussion on EB-5 legislation. With conference host Ali Jahangiri of EB5Investors Magazine and EB5Investors.com as moderator, Congressman Issa initiated the legislation discussion with his keynote address on the EB-5 program and the Skills Visa Act. The conclusion of lunch led to three more beginner and advanced panels each, with the former sessions moderated by Jeff Campion of Pathways, Joseph McCarthy of the American Dream Fund, and Kate Kalmykov of Greenberg Traurig, LLP, and the latter sessions moderated by Ali Jahangiri, Dawn Lurie of Polsinelli PC, and David Hirson of David Hirson & Partners, LLP. Congressman Issa returned to serve as a panelist in a group comprised of such EB-5 professionals as business plan writers and investment advisers. These panels examined questions regarding regional center formation, EB-5 financing for hotel developers, and the global-looking subjects of EB-5 marketing overseas and international differences in sources of funds. These final panels opened the door for outreach discussions, and accordingly, attendees continued to engage in EB-5 dialogue during the subsequent Post-Conference Cocktail Hour until 6 p.m. During this relaxed reception with Congressman Issa, approximately one hundred attendees conversed about EB-5 as they enjoyed refreshments and an upstairs view of the Newport Harbor. With the Third Annual Southern California EB-5 Conference successfully concluded, EB5Investors.com and EB5 Investors Magazine look forward to seeing you at the Las Vegas EB-5 Conference in 2015!